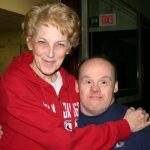 KANDU Industries Inc.Nurse Holly Retires - KANDU Industries Inc.
After 32 years, KANDU’s beloved longtime nurse, Holly Clark, is retiring. On July 30th, clients and staff said “see you later” with retirement celebrations and thoughtful handmade gifts while sharing loving memories and stories from the past three decades. Holly is KANDU’s second longest employed staff member, hired only one month after Catering Director, Rod Oksuita. Holly Clark is a shining example of what it means to work at KANDU and her kind, caring spirit will be greatly missed by all.